Proposal: It's the 21st Century. Where's My Fusion Reactor? Cheap, practical fusion may be closer than you think. Nuclear fusion is 30 years away, and always will be. That's the refrain we've heard, again and again for decades. And yet, quietly, fusion has advanced exponentially since 1970, about as quickly as Moore's Law. We've progressed, in fusion, from clunky TRS-80s and Commodore 64s, to today's iPhones and Macbooks. But this is a story that few have noticed. Unlike computers, fusion has to get really great before it's useful at all. Right now it's pretty good, but not quite good enough. It's getting close though. There's another reason the story's been missed. We've spent billions on enormous, horribly complex fusion reactors that aren't expected to be commercially available before 2050...and even then, it's hard to see how they wouldn't be too expensive. But those are not the only game in town. The real overlooked story is this: a handful of small research projects, often running on a shoestring, ready to beat the big projects at their own game. Some of these little projects have attracted serious investment, from venture capitalists and Goldman Sachs. And not a moment too soon, with CO2 levels already at 400ppm, and no significant emission cuts in sight. The clock's running out. We need something dramatic. If we may be permitted a football analogy: We're five points behind, there's half a minute left in the game, we're a long way from the endzone, and we're not going to get there in time by playing it safe. We need a long pass. We might not win, but it's the one play that gives us a chance. Or in gambling terms...it's worth drawing to an inside straight when there's enough money in the pot. The fusion projects listed here give us a shot at power competitive with fossil fuels or (in some cases) far cheaper, with no pollution, perfect safety, and no nuclear waste. Sound too good to be true? Read on. Find out what these projects are, and how we can use better funding mechanisms to improve our odds. Investment in high-risk, high-reward, low-cost research on a wide variety of approaches to nuclear fusion, focusing especially on those with the potential for very inexpensive energy production. X-Prizes for milestones, direct grants for early-stage research, knowledge sharing and open licensing. The lack of neutron radiation completely eliminates even low-level nuclear waste. But more importantly, the charged particles carrying the energy can be converted directly to electricity, without needing to heat a coolant which is then run through a turbine. This has the potential to dramatically reduce the capital cost of the powerplant. The disadvantage of boron fusion is that it's harder to achieve net power production than with D-T fusion (which of course isn't there yet either). But there are several projects with the potential to get there in the near term. Tri-Alpha is a fairly secretive private company focusing on boron fusion, with over $140 million invested by venture capitalists, Goldman-Sachs, Microsoft's Paul Allen, and most recently, the government of Russia. They hope to build a working demo plant by 2020, using direct conversion of the alpha particles to electricity. 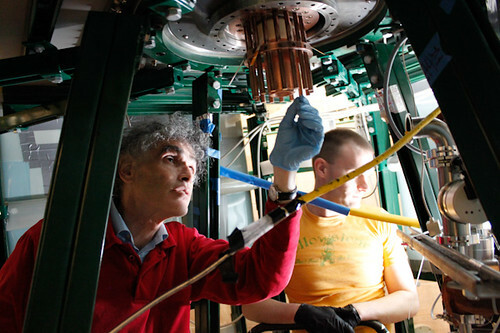 In late 2012 they released a progress report saying the physics of boron fusion was more favorable than expected, and published in Physical Review Letters. In contrast to Tri-Alpha, focus fusion is the most transparent of fusion projects, making regular public reports of their successes, failures, and challenges. It's also the least expensive of all fusion approaches. Focus Fusion uses a device called the "plasma focus," which has been used in research for several decades. In a paper published in Physics of Plasmas, the team has shown it has reached temperatures of 1.8 billion degrees C, well over the billion degrees required for boron fusion. At this point, experiments are going well, and the team is scaling up the reaction, with higher input power and density. If no roadblocks are found, breakeven could occur within a year or two. Engineering a production reactor after that would require an additional $50 million and five years. The device is pulsed, with energy output in the form of x-rays and a jet of charged particles. Electricity generation is simply a matter of aiming the jet through a coil, and capturing x-rays photoelectrically. A typical focus fusion plant would fit in a shipping container, generate 5MW, cost half a million dollars, and produce electricity at a tenth the price of coal. Lawrenceville Plasma Physics is the company researching focus fusion, with some collaboration with researchers outside the U.S. LPP operates on a shoestring. It has garnered several million dollars in investment, and thinks another million dollars or so may be sufficient to show scientific feasibility. Experiments so far have been with deuterium fuel. Correcting for fuel, LPP has achieved a higher ratio of output to input power than NIF's $4 billion laser fusion project (which uses D-T). LPP does not plan to use D-T, instead jumping straight to boron, which is much better suited for their device. Robert Bussard was one of the early pioneers of the tokamak fusion reactor, the approach used by ITER. For over a decade he worked at the Navy on a new approach using electrostatic confinement, which he dubbed the Polywell. The project was canceled, but analysis of their last experiment showed good results, and after several years the project was restarted. The Navy isn't talking much but it continues to renew funding, and there's been additional research in academia, with recent conferences in Maryland and Australia. Polywell power output scales up rapidly with the size of the reactor. A 2-meter reactor chamber would, in theory, accomplish net power for D-T fusion, and a 3-meter for boron. A demo reactor would cost several hundred million dollars. According to theoretical studies (backed by experimental verification of the basic physics), a petawatt picosecond laser igniting uncompressed fuel from the side could accomplish boron fusion with only ten times the difficulty of D-T fusion (compared to 100,000 times as difficult with NIF's spherical ignition). Papers project a 10,000x energy gain and electricity ten times cheaper than coal. Lasers of the necessary beam quality have only become available in the past decade. The largest currently available is ten petawatts; to attempt this method we'll need at least 60 petawatts. The lasers are advancing rapidly, and aren't very expensive. 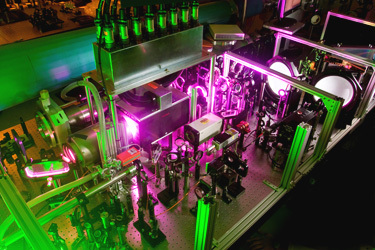 As of 2009, the most powerful was the Texas Petawatt Laser, which cost $14 million. This method could also be used for D-T fusion, with the potential for dramatically lower capital costs than NIF's approach. Levitated Dipole turns the tokamak inside-out, with a solid superconducting levitating torus, and plasma magnetically contained around it. It's a simple configuration that imitates the magnetic fields surrounding the Earth and Jupiter, creating a steady-state system in which any turbulence helps to compress the plasma. The levitated dipole looks ideal for deuterium fusion (D-D). This would require a steam turbine. However, deuterium is plentiful in seawater, providing a highly-available fuel that would last for billions of years. The deuterium in the water of one typical American shower would provide all the energy that American needs for a year. While D-D fusion does produce neutrons, they are much less energetic than with D-T fusion. Where D-T fusion requires both heavy shielding and a lithium blanket for breeding tritium (all surrounded by superconducting magnets), the levitated dipole needs only a thin-walled vacuum chamber and external cooling. An experimental device was constructed, but funding was cancelled when the U.S. government decided to concentrate more on ITER and NIF. The remaining projects are targeting deuterium-tritium fusion (D-T), the easiest to achieve. A disadvantage of D-T, aside from producing neutrons, is that tritium is a rare isotope. Tritium can be produced by bombarding lithium with neutrons from the D-T reaction, but the rate of large-scale rollout could be limited by tritium availability. Although D-T fusion doesn't have boron's potential for extreme low cost, it still may achieve competitiveness with fossil fuels. The biggest device is of course the tokamak, with ITER as the current leading experiment attempting breakeven. It's funded by governments with a budget (so far) of $20 billion dollars, for an enormous device twenty stories tall, and doesn't expect to be commercially available before 2050 or so. However, recently the Alcator C-Mod group at MIT proposed a much smaller, cheaper design, using advanced superconductors for stronger magnetic fields, modular construction, and the same FLIBE coolant used in some molten-salt fission designs. (The C-Mod already has the highest magnetic field and plasma pressure of any tokamak device.) Sadly, the Alcator C-Mod lost funding in recent cuts, with the government redirecting money towards ITER. There's growing support in Congress to restore funding. There's also NIF's laser fusion project, which lately has run into political problems. In Europe, the Stellerator and HiPER fast-laser fusion are major alternative projects. Beyond these major government efforts there are several dark-horse contenders. Sandia is attempting to use their Z-pinch device for breakeven fusion by magnetically crushing preheated fuel with a metal liner. According to simulations, they can reach approximately breakeven with their current device, and a large gain with higher energy input. Experiments without fuel have begun, and match computer simulations so far. They plan for a full integrated system test by the end of 2013, followed by a five year experimental program, hoping to achieve breakeven performance in 2016. If that is achieved, scaling up would require upgrading their machine from 27 MA to 60 MA for 100x gain, or 70 MA for 1000x gain. The machine is relatively inexpensive compared to the mainstream fusion approaches, and with the large gain, it would only require a shot every 10 seconds for a practical power plant. Lockheed-Martin recently presented, at Google SolveForX, an ongoing project attempting D-T fusion, with a 2020 target date for a 100MW reactor transportable by truck. Like the MagLIF, Helion explores a midway point between tokamak (low density plasma, long confinement) and laser inertial fusion (high density, short confinement). It's a linear device that collides two plasmas. A one-third-scale device was built with $5 million in funding, and Helion claims to have validated its approach. More recently, Helion has received about $7 million in funds from the DOE, the DOD and NASA. The company hopes to raise another $2 million by next year, $35 million in 2015-17, and $200 million for its pilot plant. General Fusion also works in that "middle ground" with a variant of magnetized target fusion. 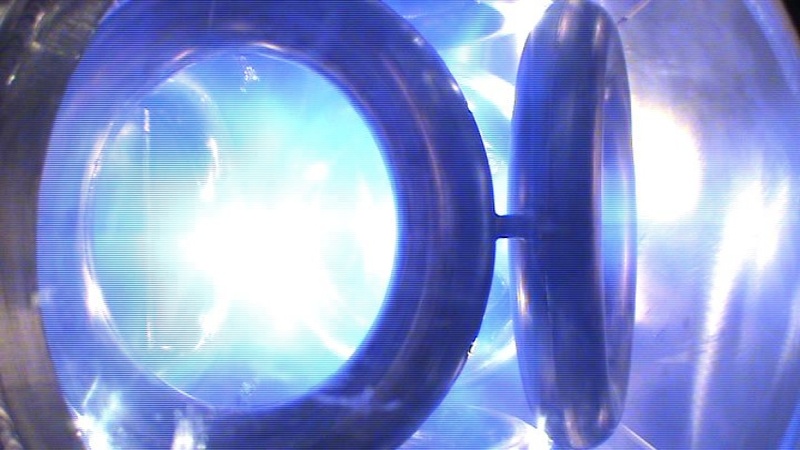 A vat of molten lead spins, opening a channel in the middle, through which two balls of plasma are injected and collide. Two hundred steam-powered pistons impact the outside of the chamber, and an acoustic shockwave compresses the plasma. Neutrons heat the lead, and some steam from the coolant is used to drive the pistons. The project is well-funded by private investment, in part by Jeff Bezos. The design is only feasible due to recent advances in computerized control systems, requiring microsecond precision which the company has already demonstrated. The company believes it is on track to show proof of feasibility in 2013, actual net gain in 2016, and a working reactor in 2020. They expect to be cost-competitive with conventional coal. Most of the money in fusion goes to a few large projects, with little prospect for near-term commercialization or breakthrough cost reduction. Many alternative approaches are underfunded, and some promising ideas lack funding entirely. Projects with investor funding tend not to share knowledge. In academia, the grant process is time-consuming, with low funding rates and poor accountability. A broader approach, funding a variety of lower-cost approaches, would distribute the risk and put more emphasis on designs with the potential for low-cost commercialization. Progress could be accelerated by the more rapid experimental turnaround of smaller designs. Open knowledge sharing would help further. Picture a grid, in which each square is an enabling technology, and we achieve commercial fusion when we've filled in enough squares to connect one side of the grid to the other. One project may fill in some squares, but be blocked by others. With shared knowledge, another project may be able to use those filled squares, finding a pathway more quickly. This "percolation model" of technological development also predicts that once fusion is first achieved, many more successful designs will follow soon after. Filling in a few more squares results in many more completed pathways. This provides the potential for rapid cost reduction. A way to amplify funding is to use the X-Prize approach. In aggregate, rocket companies spent much more in attempting to win the first X-Prize than the size of the award. A series of prizes for intermediate milestones would give investors some potential return before achieving full success. Most U.S. fusion research is funded by the DOE, which is committed to a conservative big-science approach. However, the federal government is capable of funding more innovative research. 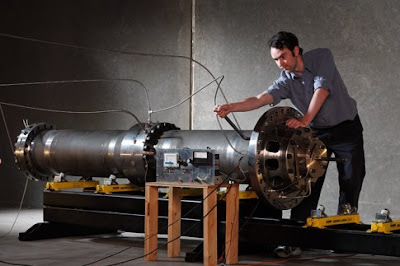 ARPA-E, the Joint Center for Energy Research, and the Advanced Manufacturing Partnership are successful examples, as well as direct research in national labs. There's also NASA, which can research compact power sources for deep-space missions, along with advanced propulsion. Many alternative fusion experiments are small enough for state governments, which could fund them as part of attempts to create high-tech hubs for economic development. According to the American Security Project, fusion already supports over 3,600 businesses and 93 research institutions, in 47 U.S. states. Large philanthropic foundations could also make a big impact. An interesting model is the foundation created by Michael Milken to combat prostate cancer. In contrast to the NIH, it funds creative ideas focused on practical results, offering quick funding in exchange for open sharing of results - no patents, no waiting for publication. The result has been a drastic acceleration of progress, and the model has been copied by several other foundations in the medical field. We can do the same for fusion, perhaps with an international consortium of funders and research projects following these broad principles. If researchers are unwilling to abandon patents, a patent pool or open licensing agreement could be helpful. State governments, philanthropists, academics, and startup companies could all participate. Aside from direct grants, the consortium could offer prizes for incremental milestones. Grassroots organizations could help promote funding at all levels. The smallest projects could even be crowdfunded directly. Fusion research is international, with major tokamak efforts in Europe, China, South Korea, and Japan. The U.S. has substantial cutting-edge research but is beginning to fall behind in tokamak research. A first step in the U.S. would be to restore funding for the Alcator C-Mod and Levitated Dipole. Many of the alternative projects are in the U.S., which may be the perfect place for a network of universities, national labs, entrepreneurs, and investors to bootstrap major investment in newer fusion approaches. The X-Prize Foundation and Milken's FasterCures think tank could perhaps provide valuable advice. Specifically then, this proposal advocates an international foundation, centered in the U.S., which offers prizes for a variety of fusion milestones, and direct grants for innovative approaches that are too early-stage to compete directly for milestone prizes. In exchange for prizes and grants, researchers will be required to promptly share experimental results, with sufficient information to reproduce them, and agree to liberal licensing terms for any patents. Grants should be awarded quickly, but with good accountability for results. Grants could be provided in part by state governments interested in developing high-tech local economies. Prize funding can come from philanthropic foundations and national governments. The U.S. government has funded similar prizes before, including the NASA Centennial Challenges and the DARPA Grand Challenge. The original X-Prize was funded by an insurance policy against the chance of a payout. With practical fusion widely considered "thirty years away," such policies may be a relatively cheap means of funding large prizes for major breakthroughs. Providing such policies could be in the broader long-term interest of large reinsurers, who are concerned about major losses due to future climate-related disasters. U.S. carbon emissions in Q1 2012 were at the lowest level in 20 years, because natural gas has gotten cheaper than coal. When the price is right, energy transitions can be surprisingly rapid. According to the DICE-2007 model, introduction of a carbon-neutral energy source competitive with fossil fuels would keep global warming below 1C. Nordhaus writes, "The low-cost backstop scenario assumes the existence of an energy source that is environmentally safe and competitive with fossil fuels. This option is extremely attractive from an economic vantage point, with a positive present value of $17 trillion relative to the baseline. Although it might not be currently feasible, the high value of the low-cost backup technology suggests that intensive research on such energy sources is justified." (A Question of Balance, p. 88) Several fusion technologies could do at least this well, and perhaps substantially better. Abundant, cheap, nonpolluting energy would be an enormous boon to the economy. Among other benefits, it could allow large-scale desalination, alleviating water shortages and perhaps even reducing atmospheric CO2 by greening the Sahara. Cheap energy could also help generate hydrocarbon fuels from atmospheric CO2, as described in 2011's Cycling Carbon. Several forms of fusion also make really good rockets. Focus fusion is essentially already a rocket. NASA is currently funding the company behind Helion for a D-T fusion rocket project, which hopes to achieve a 5x energy gain around 2017, build a full-scale demo by 2020, and by 2030 accomplish a 30 to 90 day manned trip to Mars. In combination with other efforts (cheaper launch by SpaceX, asteroid mining by Planetary Resources), fusion rockets could help open the vast resources of the solar system. Many of the fusion projects mentioned here are quite inexpensive to develop, on the order of tens of millions to hundreds of millions, rather than billions to tens of billions like the major projects (ITER, NIF). By using X-Prizes, we get a multiplier effect. Scaled Composites, the winner of the $10 million X-Prize, spent a reported $25 million to develop its rocket (planning to use the technology for profit afterwards). The total investment by all competitors was about $100 million. If we manage similar proportions, we multiply our investment by a factor of fifty, and get lots of small projects working in parallel, which is exactly what we want. A prize structure may seem contrary to open information sharing, and that will have to be treated carefully. However, the Netflix Prize, a million-dollar machine learning competition, developed a thriving community of people sharing their ideas. For fusion, the prize money is just the beginning. Maximizing the chance of success is in everybody's interest. At focus fusion's capital cost of $100k per megawatt, the total cost to replace the entire world energy supply would be only $2 trillion. More expensive approaches would of course increase that total. This would be profitable investment, rather than mere sunk cost, especially if utility commissions aren't overly aggressive in reducing rates. Research is ongoing, and several projects think they have a good shot at producing net power within the next five years. The first demonstration plants could appear as early as 2020, if any of the most aggressive projects succeed as quickly as they hope. More likely, unexpected problems will arise. In that case, good collaboration and creative funding will be increasingly important. It may seem unduly optimistic to project such near-term success for small private projects, when large government efforts don't expect to reach the goal until 2050 or so. There is some historical precedent, however. At the beginning of the 20th Century, human heavier-than-air flight was widely considered impossible. People had been attempting it for a hundred years, with a wide variety of designs. All failed. In 1898, the U.S. government funded an expensive project to build the first successful flyer. Sam Langley was given $1.3 million (2012 dollars), with which he hired a large staff, purchased all manner of supporting equipment, and built a large four-winged flyer. In 1903, Langley's project attempted two test flights. Both failed miserably. The public wasn't surprised. Flight was "thirty years away, and always would be." Nine days later, two bicycle mechanics made the first successful powered flight. Their total expenditure, in 2012 dollars, was $25,400. Our own Kitty Hawk moment may be closer than we think. While this is the only proposal on fusion, several proposals advocate developing advanced fission reactors. An early historical precedent for the X-Prize is the Orteig Prize, which was claimed by Charles Lindbergh. It's the 21st Century. Where's My Fusion Reactor?